A master of wildlife and landscape photography, Raj Das has been a member of the Cape Cod Arts Association since 2013. Over the years, his photographs have garnered top honors in several exhibitions, his most noted works including “Snowy on the Prowl,” depicting a swooping owl, and several shots of Cape Cod lighthouses. Das currently lives in Framingham. When did you start taking photographs? Since I was 12 or 13, but I became really serious [when] I came to the United States. I first came to California in 1997 from Kolkata, India. I was 27 at that time. I then moved to the Boston area in 1998. I use both digital as well as analog film. On the film side, mainly street photography as well as small landscapes, primarily in black and white. On the digital side, I use Canon equipment. Moving to digital gave me a way to share my experiences here in the US quickly with my family and friends back in India. In 2014, I decided to quit my job and pursue photography full time. I just completed my first year at the New England School of Photography. Previously, I had been doing photography mostly on the weekends really, as a freelance photographer doing small projects here and there. Do you have any primary places where you like to take photographs? Cape Cod is one of my most favorite places to go and photograph. Another place I like a lot is in Concord, called The Great Meadows. My photographs primarily focus on everyday landscapes and familiar spaces. I try to look at them in a different way, focusing primarily on the natural light, shadows, lines, shapes, forms. Do you have a favorite photograph that you’ve taken? It’s like you’re a parent and you have to pick your favorite child. There is one that I took of the Milky Way in Truro. 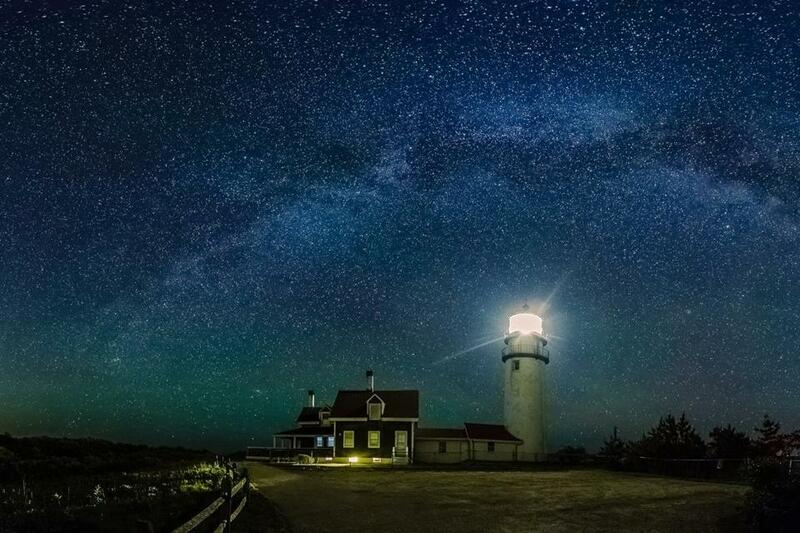 It’s called “Cape Cod Nocturne.” I find it really shows the beauty of the area and the clear skies, devoid of light pollution or pollution in the air. That photograph has won a few awards. Do your photos have any underlying themes? Primarily, how we as humans feel insignificant in the face of nature; [that] has such a huge role to play in how we either coexist with or destroy nature, so that’s what I try to portray. It’s also an exploration of myself, and how I care about nature. I volunteer for several conservation organizations – it allows me to get out and enjoy nature and also discover myself and what I care about. Is there a particular time of day when you most like to take photographs? Ideally, the morning hours or the evening hours. I like contrasting light as well – I shoot right in the middle of the day when I make black and white photographs, whether I’m using my digital camera or film. On some days I’ll decide, ‘These are the kinds of pictures I’m trying to make.’ I’ll look at the weather and [think], “Is this conducive to the kind of pictures I want?’ and I go out based on that. Night photography is something I enjoy as well. How often are you shooting? Right now, pretty much every day. I’m having the time of my life, really. I’m not just working on school assignments, but all sorts of personal projects. I wish I could get up every morning and go and photograph. It doesn’t always happen, but I think that’s part of the life of the photographer: You won’t be able to take the kind of photographs that you want every day. You also have to figure out a way to make a living. Whether you are working for a client or you’re working for a specific assignment, being able to do it in a way that is totally you, as well as meets the needs of the client, striking that balance. I think that’s the Holy Grail. How has the Cape Cod community received your work? Overall, I feel it has been well received. The responses I’ve received have all been very encouraging. There are a lot of really good photographers and artists there and I feel lucky that I am part of that community. What are you working on now? Do you have a project in the works? There are a couple of projects that I am working on around the Cape. There’s one that I call “Exist/Co-exist,” exploring the theme of nature around the Cape and how humans coexist, how we impact natural activities around the salt marshes, the rivers, the estuaries, the shores. It’s a work in progress, mainly to show huge landscapes and elements of human presence there. Emeralde Jensen-Roberts is a freelance writer. Follow her on Twitter @emeraldejr.